The main philosophy at Countryside's Pet Paradise is to provide the best possible home-away-from-home care for your pet in a professional, safe, and caring way. We provide exceptional care with lots of love for your four-legged family members. All of our services are personalized to meet your individual needs. If you would like to set up a reservation for any of our services, or if you would simply like to drop us a line, please feel free to contact us! Countryside's Pet Paradise took The Dog Gurus Off-Leash Play Pet Center Safety Pledge! We proudly commit that our dog daycare program has been designed for the safety of all dogs. In taking the pledge we strive to ensure the physical safety of each dog and our goal is for every dog to go home from our center behaviorally and emotionally better than when they arrived. 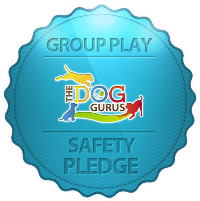 Visit The Dog Gurus to view our pledge, take the Off-Leash Play Pet Owner Safety Pledge, and learn how you can keep your dog safe during play. We offer a variety of activities for your pet, such as group or one-on-one playtimes and a la carte menu options including home-made frosty paws and biscuits and gravy. We believe that an active pet is a happy pet! Find out more about our activities and start planning your pet's stay. Special care is taken to ensure your pet has all the comforts of home while staying with us. If you have any information we may need to know, please feel free to let us know upon drop off or when you call to make a reservation. “Our staff makes sure each individual animal has the most comfortable stay possible, but keep in mind that you as the owner know your pet the best, so we rely on what you tell us. For more information on our services, please feel free to contact us or come by for a tour any time during our business hours. We look forward to meeting you and your pets!